A pioneering arts project is inspiring black and minority ethic men with severe mental health problems to turn their lives around. Mark Thomas reports. Jai has experienced mental health issues for most of his life. As a young man he struggled to make friends and socialise and even as he grew older, he found it almost impossible to talk about his problems to anyone other than his wife. Yet today, the 48-year-old is preparing to visit the House of Lords to take part in a national prize-giving and celebration event, after his work was selected to appear in the prestigious 2015 ‘Yellow Book’. Published by rethinkyourmind - a project endorsed by Stephen Fry, which aims to creatively support positive mental health, the book features 50 winning pieces of art, photography and poetry, created by professional and amateur artists and writers, both with and without experience of mental health challenges. It is a remarkable turnaround for Indian-born Jai, who came to the UK as a teenager without knowing a word of the English language and soon dropped out of school because of bullying. And he credits much of his new-found confidence to his involvement in Showcase Smoothie, a pioneering literature and music-based project led by Leicestershire Partnership NHS Trust (LPT). The project, which has influential Jamaican-born performance poet Jean Binta Breeze MBE as its patron, predominantly targets young black and minority ethnic men with severe and enduring mental health issues and aims to support their personal and creative development. Jai says: “About 10 years ago I had a breakdown and went into hospital. I didn’t dare talk about my problems before, I was so scared, but I have been getting help since then. Jai is one of six artists and writers who all attend LPT’s Arts in Health projects, who have been invited to the House of Lords on today, Wednesday 24th June for the official launch of the ‘Yellow Book’. Jai’s work was selected alongside that of two other Showcase Smoothie members, Carlton Brown and Ian Liburd, from 280 entries submitted nationally for inclusion in the book. The event will also see the launch of four music singles, featuring the likes of Mark Morriss (former Bluetones frontman) plus some of the winning poetry, artwork and photography. Showcase Smoothie was initially launched seven years ago and secured Arts Council Funding in 2011 to build on its early successes. Participating artists attend a weekly programme of creative workshops, divided over two project sides, Showcase and Smoothie, which are open to young men, and adult men and women, respectively. The creative programme includes writing, dj-ing, mc-ing, music, dance and film, as well as one-to-one and group mentoring sessions. Each year, sessions culminate in commissioned performances, publications and recordings, with Showcase Smoothie existing as both an enabler, producer and agency for its performers. The project was conceived in response to evidence that as a group, young black and minority ethnic men are statistically more likely to experience inequalities within the mental health system. 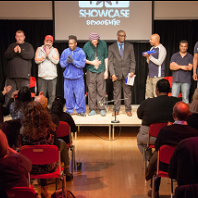 Showcase Smoothie aims to recognise and address such inequalities, foster cross-cultural cohesion and understanding, nurture artistic ability and challenge the stigma and misunderstanding that can surround mental health issues. The impact of the project is currently being evaluated by a team of clinical psychologists and doctoral clinical psychology trainees from the University of Leicester’s School of Psychology and LPT. Although the evaluation is on-going, an initial report by the project team in December 2014 concluded that Showcase Smoothie had had a positive effect on the artists involved over a six month period. They had shown an improvement in several areas including their self-esteem and self-evaluation beliefs and there was an overarching theme of ‘hope’. Showcase Smoothie is also being funded this year by NHS England to deliver a new project, Healthy Culture. In response to evidence of the increased smoking, drinking, drug use and poor diet prevalent within Showcase Smoothie’s targeted client group, a seven month focus will culminate in October 2015 in the publication of an illustrated anthology, using literature and art to explore healthy lifestyles. To find out more visit www.showcasesmoothie.com/.